The Scottish wildcat is being pushed towards the brink of extinction because of loopholes in the law and cross-breeding with domestic cats, says a report published today. 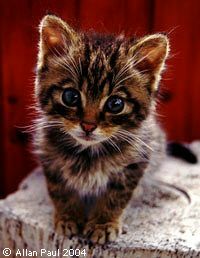 Between 1,000 and 4,000 wildcats are thought to survive in the mountains of northern Scotland but estimates vary widely because the definition of a true wildcat is disputed. This uncertainty has hampered the conservation of the species, according to the report, The State of Britain's Mammals 2004 by the charity Mammals Trust UK. By the tightest definition of a "true" wildcat - which involves a comparison with a specimen in the Natural History Museum in London stuffed in 1904 and other representative specimens - as few as 400 pristine, pre-Iron Age-type, wildcats are thought to survive. No one can be sure whether the museum specimens - with their tabby-like markings but a much thicker, black banded tail - represent the full variation originally found in pristine "classical" wildcats, since domestic cats, which are very closely related, were introduced with the Romans. There were 2,000 years of opportunities for cross-breeding before the early museum specimens died, so there is no way of knowing whether one with, say, a particular stripe variation, or even white paws, could have occurred in the wild before hybridisation began. Since a 1990 court case over the killing of an alleged wildcat cast doubt on the capacity of expert witnesses to identify wildcats, the protection given to the species by the Wildlife and Countryside Act has been ineffective. Since moorland gamekeepers legitimately kill feral cats, there are concerns that some wildcats, along with wildcat hybrids, may have been killed while this loophole has existed. The trust's report calls for legal protection of the wildcat to be upgraded urgently and for the wildcat to be recognised as a "priority species" under the Government's Biodiversity Action Plan. Prof David Macdonald of Oxford University's Wildlife Conservation Research Unit and an author of the report, is soon to publish an action plan advocating the protection of both those with pristine wildcat characteristics and possible hybrids. In protection areas for wildcats, it recommends "any striped tabby cat with a bushy tail and a black tip would be given the benefit of the doubt and treated as protected".